The Glenlivet Captain's Reserve is a Speyside single malt selectively finished in high-quality Cognac casks. 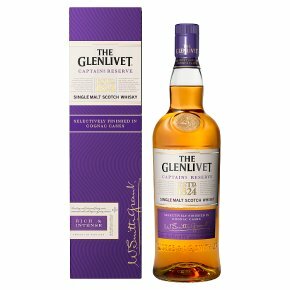 After maturing in bourbon and sherry casks, The Glenlivet whisky is finished in ex-cognac casks for at least 6 months, creating a unique rich intense flavour coming from the raisin-sweet taste of Cognac and the signature citrus notes and creamy smoothness of The Glenlivet. A whisky inspired by the unique character of its namesake, Captain Bill, that will take you on a journey from the misty glens of Scottish Speyside to the rolling vineyards of French Cognac with every sip. Sold with its signature gift box, making this the perfect whisky to celebrate a special occasion. Serving suggestion: Drink to your own preference, straight up or with a drop of water to release its intense and rich character.